A Volvo S90 sedan is loaded into a container for export to Europe. Volvo has started exporting its S90 flagship sedan to Europe from China. The first S90s will arrive in Zeebrugge, Belgium, on Thursday, Volvo said in a statement. The sedans were built at the automaker's plant in Daqing, northern China. Volvo has consolidated the bulk of its S90 output in China after moving production last year from its Swedish headquarters in Torslanda, near Gothenburg. Production of S90 models for shipment began in November in China. Volvo has moved S90 production to Daqing factory to free capacity in the Torslanda factory to keep up with demand for the XC90 and V90 and for expected high demand for the new-generation XC60. Volvo began exports to the U.S. of China-built S60 sedans in 2015, making it the first Western automaker to export premium vehicles from China. The first China-built S90s are due to arrive in the U.S. in June, a Volvo spokesman told Automotive News Europe. 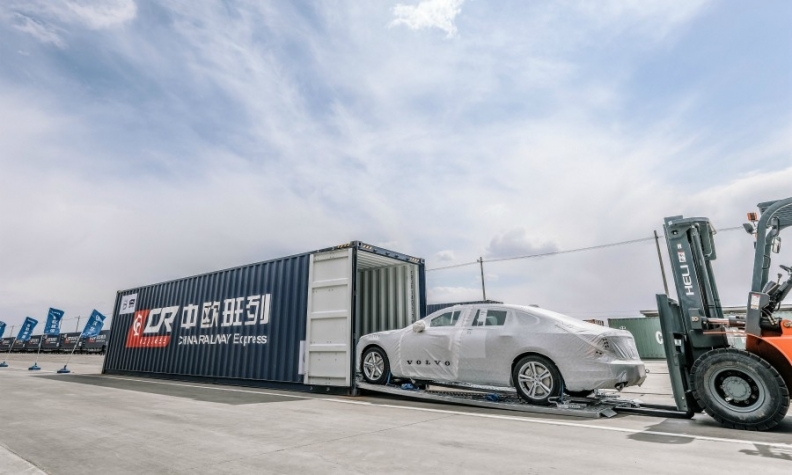 The European shipments will travel along the recently opened China-Europe railway link, which Volvo says cuts the time it takes to transport vehicles to Europe by two-thirds to 20 days compared with the sea route. The trains will carry about 120 cars, which are transported in specially designed containers. Initially, trains will depart from Daqing once a week. This can increase in line with growing volumes, Volvo said. The first cars will arrive in Belgium the same week that China's Prime Minister Li Keqiang is due to visit the country. Li Keqiang is scheduled to meet with Volvo Chairman Li Shufu and Volvo CEO Hakan Samuelsson. Volvo is relying on additional output in China to help it reach a goal of boosting global vehicle sales to 800,000 by 2020. The automaker sold 534,332 cars last year, a rise of 6.2 percent. China's Zhejiang Geely Holding bought Volvo Cars from Ford Motor in 2010. Volvo S90 vehicle line director Kent Falck told Automotive News Europe last year that it would be difficult for the automaker to fulfill forthcoming orders for the S90 because of strong demand for its XC90 crossover. Last autumn, Volvo dealers in Germany were telling customers that it would take three to four months to get the S90 because of the high demand. A German dealer reached Wednesday by Automotive News Europe said the wait time is now more than six months.